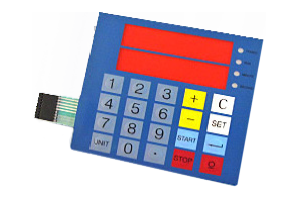 At Elite Technology, we specialize in electronic membrane switches, also called membrane panels or keypads. These low-power electronic membrane switches are used to identify and control the functions of machines and other equipment in a variety of applications, industries, and environments. Our electronic membrane switches are low-profile, flexible circuits screen-printed on a thin plastic substrate (usually polyester) using either silver or graphite conductive ink, bonded and assembled with a number of adhesive layers, then topped with a graphic interface or graphic overlay that indicates the function of each key on a membrane switch keypad. To improve the user experience, membrane switch keypads often include metal domes or polydomes that provide tactile, audible or visual feedback, such as a snap that can be felt and/or heard or backlighting that indicates when the key is pressed or activated. Contact us today for more information about electronic membrane switches and membrane switch keypads from Elite Technology.